Looking for a Christmas gift to help settle those inevitable yule-time arguments? This unique Magic 8-ball will be able to help, complete with a geeky twist. The Magic Geek Ball from ThinkGeek is a nerdy take on the classic Abe Bookman invention. Instead of revealing traditional responses such as 'Signs point to yes', 'Reply hazy, try again' and 'Don't count on it', this new take on the fortune-telling toy will offer up such alternatives as "LOL", "Fail", "Can Has", "404 Error", and more. The $7.99 novelty toy, which is available now, has a total of twenty different geeky sayings hidden within. The classic 8-ball symbol typically found on Magic 8-balls has been replaced with the ubiquitous symbol. Of course, if you don't mind a challenge you could always try and customize an existing Magic 8-ball yourself to feature your own messages. Looking for other Christmas gift suggestions? 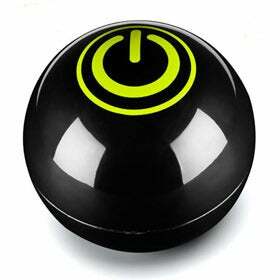 GeekTech recently looked at a selection of neat geeky gadgetry; why not ask this online Magic 8-ball if you'll be getting any this year?